Wing trimming is an important decision that you, the owner, will need to make at some point in your relationship with your bird. To help make your decision you must know why you want to let the bird fly or to have the wings clipped. Most people avoid clipping wings so that the bird can behave as he would in nature. However, keeping the wings brings with it a lot of responsibility on your part. With the bird in free flight you must ensure that the area the bird will fly in is safe from hazards that could lead to injury or death of your bird; I.E. Open water such as sinks, toilets, and tubs, doors opening and closing, ceiling fans, windows, cleaning supplies, dangerous house plants and much more. 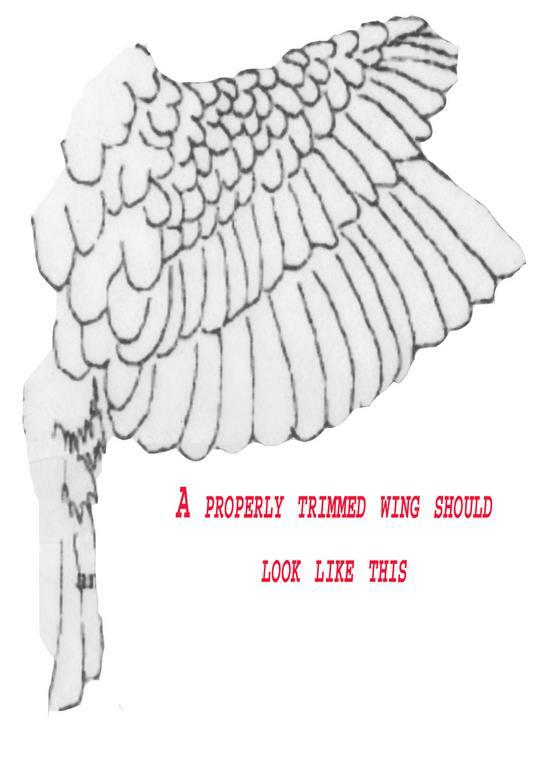 The decision to clip the wings is most often made to protect the bird from the dangers of free flight as explained above but, trimming the wings has as many responsibilities and dangers as free flight. A bird that cannot fly could be stepped on, chased by other pets in the house, fall into open containers such as clothes hampers and trashcans, and most importantly, since they cannot fly high to feel secure, they will hide under and between items in the home, sometimes causing them to become stuck. Either way a good rule of thumb is that when your bird is out of its cage, there should always be someone to keep an eye on them. Just like a human baby, the minute you turn your back is when disaster strikes. How to Properly Trim the Wings. wings. More trimming will not correct this problem. The wing feathers will have to molt out and the new feathers grow in fully before a proper trim can correct the problem and that may take a long time. 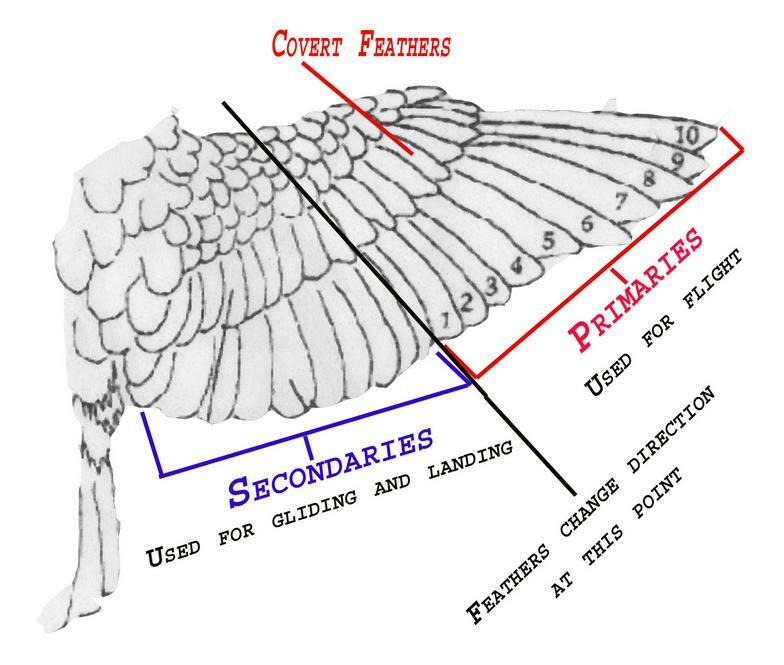 To properly trim the wings the first 4 or 5 primaries (10 thru 6 in photo above) on both sides should be clipped, one at a time, to just below the covert feathers. This will keep the clipped ends from poking the bird in the side when the wings are folded. Always clip both sides equally. Never clip just one wing. Heavy body birds such as Grays and Amazons may only need four feathers clipped, whereas lighter birds such as Conures, Senegals, and cockatoos may need as many as 6 or 7 feathers clipped. It really depends on the bird’s strength, weight, and ability to fly as to how many feathers need to be clipped. If you are not sure, clip a few off of both sides and give the bird a flight-test. If you need to clip more, do so one at a time until the bird can flutter safely to the ground. When trimming, BEWARE OF BLOOD FEATHERS!! All feathers start out as blood feathers. In these immature feathers the shaft will look like a dark tube and depending on the age of the feather may have a partial feather sticking out from the top. 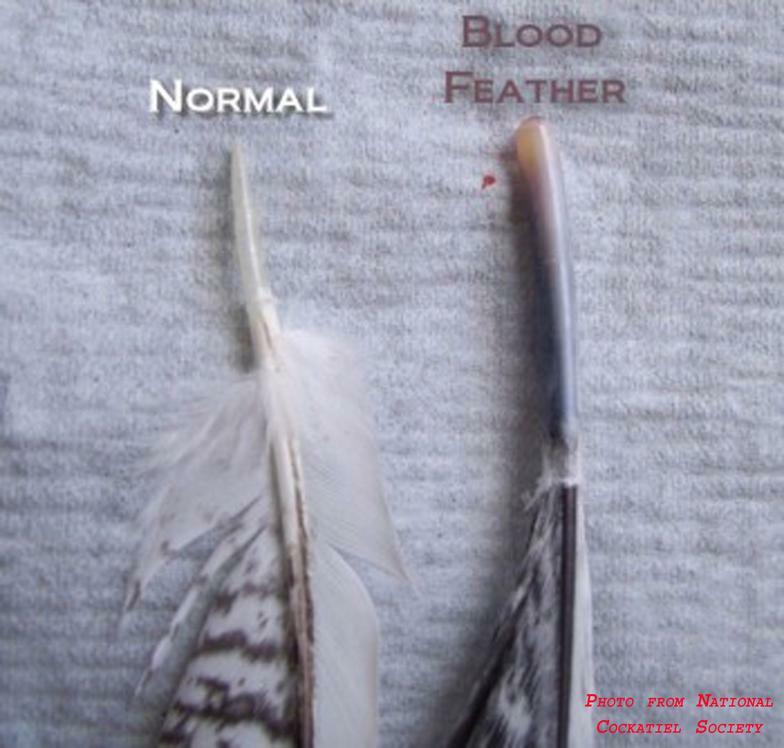 As the feather matures the blood supply recedes and the feather begins to unfold. When the quill becomes clear, the danger of bleeding is gone.